Using a first-ever cloud-based builder, Kramer has replaced antiquated custom code setup with an intuitive, drag-and-drop interface. Install, configure and modify your control system, whenever you like, without any prior programming knowledge. 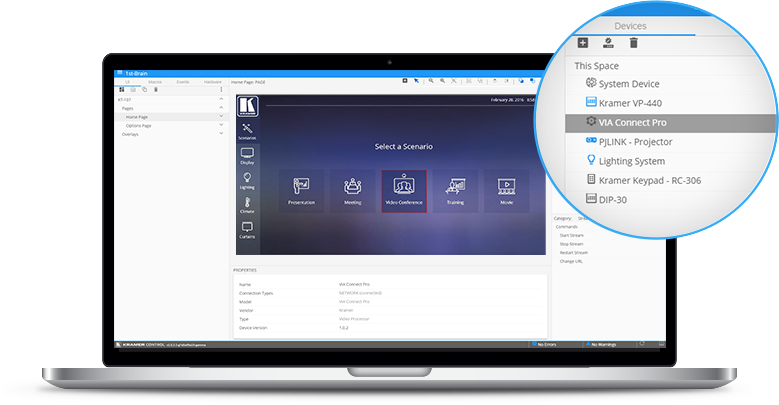 Kramer Control provides a comprehensive master library of pre-installed device drivers, enabling you to control any device imaginable with drag-and-drop simplicity. The Kramer Touch is designed to control a commercial space. Built according to the last word in industrial design, the Kramer Touch offers perfect-fit functionality in a sleek design. You can use the Kramer Control browser-based solution on Kramer’s elegant dedicated touch panel or any commercially available tablet. Kramer touch panels are built to the highest standards of cutting-edge tablet design. Easily personalize the control interface any way you like. Choose from a vast selection of controls and toggles to allow any mode of operation. While legacy systems often limit the number of simultaneous users and interactions, our agile control system supports an unlimited number of users and devices. Available in compact form factor with PoE and 16 ports or large scale master/space controller with 32 ports.